Quill loves to drink out of any cup that isn’t his. You know what’s going to happen next, right? Yep. That particular pickle jar turned glassware went smash and, alas, another one bites the dust. Despite sweeping, vacuuming, and getting down on the floor to search for stray shards, I still managed to get a piece of glass in my foot 2 days later. All of our adult glassware is the result of having a house full of pickle lovers and our kid cups are former jelly jars because we go through cream cheese and jelly sandwiches (a la “Cloudy With a Chance of Meatballs”) at a fierce rate. And for now, despite the occasional hazardous condition, these mostly work out fine. However, I know these jars won’t be coming with us on the bus. Not stackable, breakable, and the thought of the constant clinking sound as we drive down the road sends me into a fit of eye twitches...not busworthy. So the search begins. Now that we are starting to move into the interior build on the bus, I’m really starting to consider what’s going to be occupying that precious, small space. So what qualifies as busworthy? And I think that I have found a replacement for our pickle and jelly jars that meets all of those requirements! The boys and I had an excellent time testing everything out. This 8 oz half pint cup in Sea Swirl was immediately claimed by Silas as his and his alone. (“Mama, it has GREEN on it. GREEN is MY COLOR.” “Yeah, but it also has blue…that’s Eli’s color.” *scowling preschool eyes of death*) It’s just the right size for small hands. It’s squeezey and bouncy, but thick enough that it would take a concerted effort to smush it hard enough for the contents to go flying. An awesome part of these cups is the fact that you can get an additional lid that fits both the big full size pint and the little half pint. Anything that does double duty and doesn’t leave me searching for a specific size to fit a particular cup is a winner in my book. Besides cups, they also sent us two bowls. 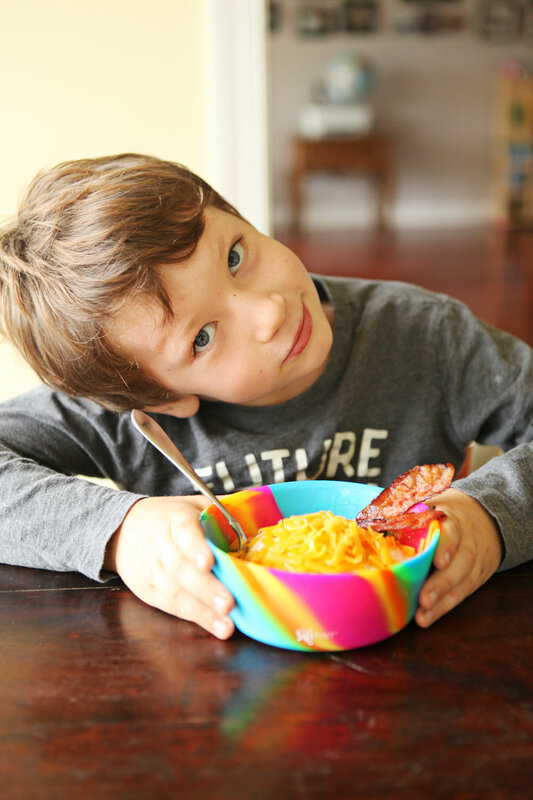 Bigger than our regular kid sized bowls, but not too big, these were perfect for our current favorite breakfast…buttery grits topped with a pop-able egg, cheese, and bacon. Thank goodness it’s finally fall here in the South! Eating grits in the summer just feels wrong. The bowls stack within each other and because the silicone has some grip to it, they won’t slide around in any bus cabinets! Score! They are sturdy enough that I didn’t think twice about letting the boys carry bowls of cereal and milk that they made themselves (i.e. fuller than good sense would allow) to the table with no worries about spills. I’ve got 4 of these bowls hanging out in my Silipint cart right this very minute. You’d never know that I’ve got several college degrees after seeing me trying to figure this next one out. Quill immediately decided it was a hat. And then a spectacular bag for carrying things about. Seriously. It took a solid 2 days of hanging out with this thing to figure out that it’s a dog bowl and I’m an idiot. By that time, it had been used to haul sticks and tools, filled with dirt, worn as a hat by everyone in the family, and was floating in the pool when it dawned on me to try flipping it around the other way. According to my busworthy checklist, all of my requirements have been checked! Kid-friendly: Yep! The kids think these are fun and non-breakable seals the deal. Environmentally-friendly: Yes! Silicone is safe, abundant, and recyclable. It’s also BPA, BPS, and phthalate free! Plus, since it’s unbreakable and reusable, it’s much more earth friendly than using disposable cups or bowls. Bonus points for the fact that buying from Silipint means we’re supporting a U.S. based small business. Budget-friendly: The cups we’re buying are all under $10 each! Space: The cups and bowls stack or are foldable enough to put one cup into another. Multi-use-friendly: I CAN BAKE IN THESE. OMG. Also, hats for the children. Real-life-friendly: The fact that these are unbreakable and reusable make them perfect for buslife. I do have one complaint. (Are you listening new friends at Silipint?) The color selection. 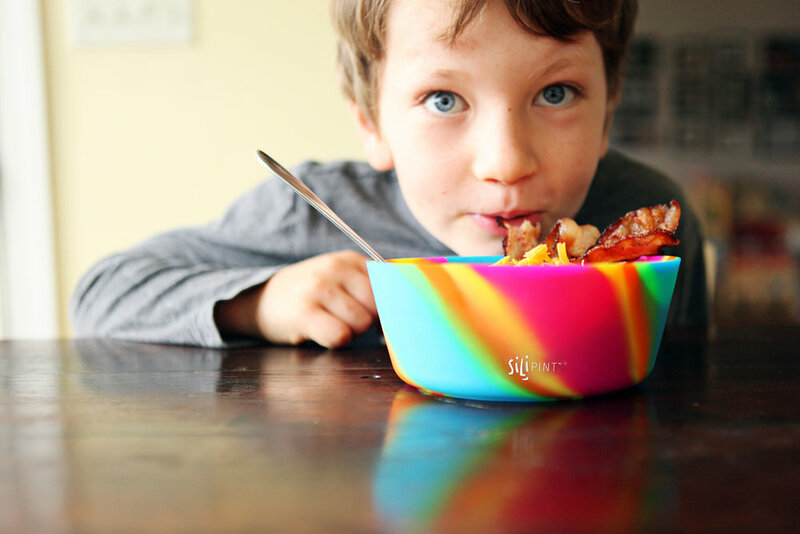 Listen, I love tie dye as much as the next hippie bus owner (seriously, Quill lives in that yellow tie dye shirt and we have a FAMILY TIE DYE PARTY every summer, for goodness sake), but I *really* don’t want to drink out of it. I’m about to start living in 250 sq ft with all these children...the last thing I need is something else that’s visually loud. Colors aside, we love these and we hope you’ll love them, too! Make sure you sign up for the newsletter over at www.silipint.com to get 10% off.